Voted Best Growler Station in the "Best of the city" edition of Cincinnati Magazine! Voted Best Local Brewery for Mash Cult Brewing in the Reader's Choice competition by Cincinnati Magazine! 2018 Bourbon Donation Applications available here! We carry a complete selection of Liquor, Wine, Beer, Kegs, Party Supplies, Balloons, Cigars, and Kentucky Proud Food. At Party Town, we have all your party needs! 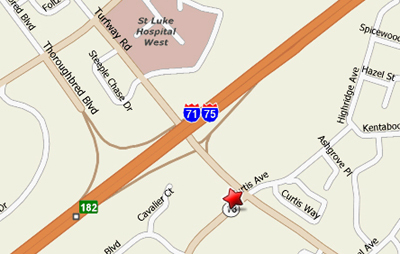 Located in Northern Kentucky, we are easily accessible from either I-75 or I-275. Just take exit 182 (Turfway Road) from I-71/75 in Florence, KY. Since 2003, Party Town has served the Northern KY area as a retail package store selling liquor, wine, beer, party decor, Kentucky Proud foods and cigars. We offer wine tastings every Saturday from 3-5pm and Friday Night Flights beer events from 5:30-7pm. Voted “Best Of City” by Cincinnati Magazine, we offer a 20 handle growlers to go draft system and thousands of selections in our beer, wine and spirits departments. Click on the map below to get directions to Party Town!!!! !